Well Folks… you're going to have to bear with us for one more episode. Mike's voice is still not back and we're experimenting with our setup. We'll get there folks… we promise!!! 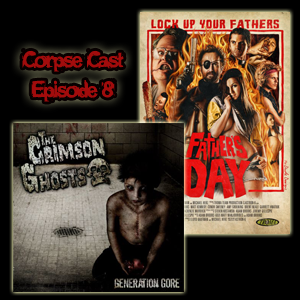 Anyway, this episode we talk about The Crimson Ghosts: Generation Gore and Father's Day (2011). Folks… we just have to warn you… Something must have been in the water because the filter came off and we're left with one heckuva episode… You've been warned!